I have many memories of Henri Selmer & Co in the UK, having been a part of the company from 1969 until 1976. John Cochrane was Chairman when I joined as Southern Area Representative. My boss then was Dave Seville. During 1970 CMI (Chicago Musical Instruments) bought the company and replaced Mr Cochrane with Michael Nugent, an Englishman who had studied at Harvard. Until then, Gibson was our most prestigious brand but, as with much of our catalogue then, overpriced. Michael Nugent applied market principles and the lowering of prices led to a dramatic increase in sales. At that time Dave Seville went to work in Europe for CMI and I became Sales Manager. In 1973 CMI sold out to an English consortium whose other main interest was a chain of South London funeral directors! Michael Nugent went back to the USA and became a Vice President of CMI and Malcolm Parkin assumed the Chairman's role. 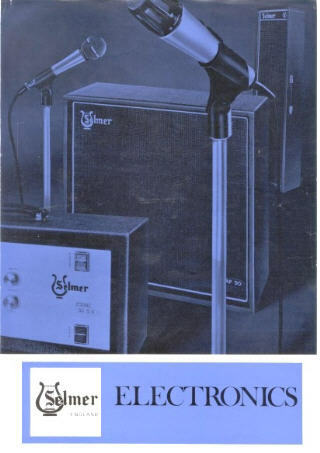 At this time amplifier production was becoming expensive and suppliers were letting Selmer down leading to customer dissatisfaction. Amancio Da Silva came to Braintree to help solve this by creating new designs, but Jim Marshall had succeeded in producing the valve sound and the market was his. Norlin Music of USA then came on the scene and took over Selmer. Dean Kerr was acting Chairman and I became Sales Director. At that point the company ceased to be known as Selmer and traded as Norlin Music. We were able to enter the percussion market with Pearl Drums and, from a marketing point of view things seemed to be going steady. However, the Norlin agenda was diverse. Their most profitable area was in Ecuadorian beer and electronic parts made in South America. Soon after I left to join Yamaha in 1976, Norlin moved all Gibson distribution to Rotterdam. Norlin then decided to off-load the least profitable parts of their business and close Braintree down. The Gibson agency went to Rosetti, together with Doug Ellis who had succeeded me as Sales Director. He and Barry Warner subsequently bought the company. The Vincent Bach Corporation opened a UK company to market Henri Selmer brass and woodwind instruments. Pearl Drums opened their own UK operation, and Yamaha guitars and drums came to me at Yamaha. The link through all of this was Dean Kerr. Dean came to London in the sixties as trumpet player with the Clyde Valley Stompers and joined Selmer in Theobalds Road when the Jazz business slowed down. He started as a packer, and in fact he organised the move to Braintree. He subsequently became purchasing director, administration director and, for a time, managing director. When Norlin finally 'sold the jerseys', Dean was kept on to uphold the repair facility for Lowery organs. He remained the sole employee and retired in the early eighties. Sadly, he passed away a few years ago. 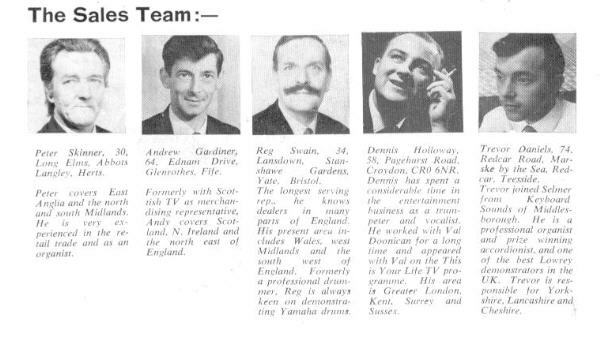 The Selmer Sales Team in 1970 - extract from the Piano World May 1970 Issue.